While wildfire burns a hole in our hearts, it’s time to get hot and heavy where it matters most: downtown Durango! Tired of donating socks and dreaming of another Hurricane Bud? 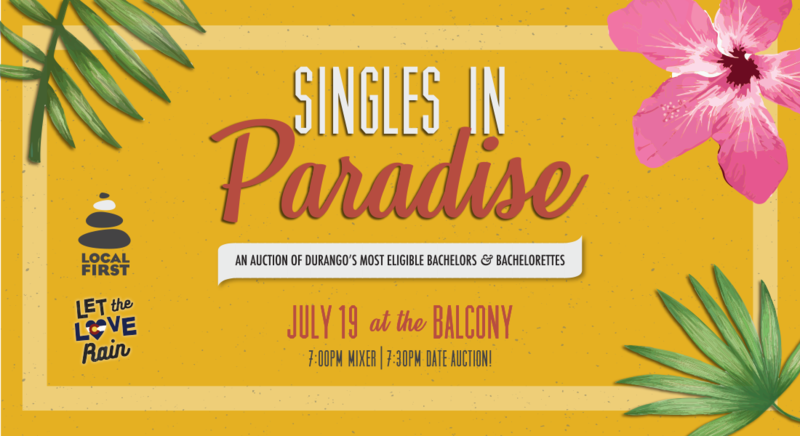 Put your wet dreams to action by signing up for the Let the Love Rain “Singles in Paradise” date auction taking place Thursday, July 19, at the Balcony Bar & Grill. Calling all stag males and females ages 21 and up: whether you’re a member of the lonely hearts club or just a single ready to mingle, bring your A-game and that winning smile to the Balcony Backstage and raise some money for our local, independent businesses that need all of the support they can get. Whatever floats your boat, dream big, and incorporate just ONE Local First member businesses in your date (for a full list of participating businesses click here). So long as you receive a bid of no less than $30, you shall receive $30 to make this dream date a reality. All remaining proceeds benefit Local First and their efforts to flood our local economy with some much-needed cash! My Durango dream date starts with ___________(activity of choice) followed by ___________(restaurant, brewery, ice cream, etc.). The fine print: Please note that by signing up for this brilliant, selfless fundraiser, you are not bound to marry your highest bidder. You are not beholden to high five or do anything physical. Local First is not liable for total disasters, but we will take full credit should this life-changing event turn into matrimonial bliss. 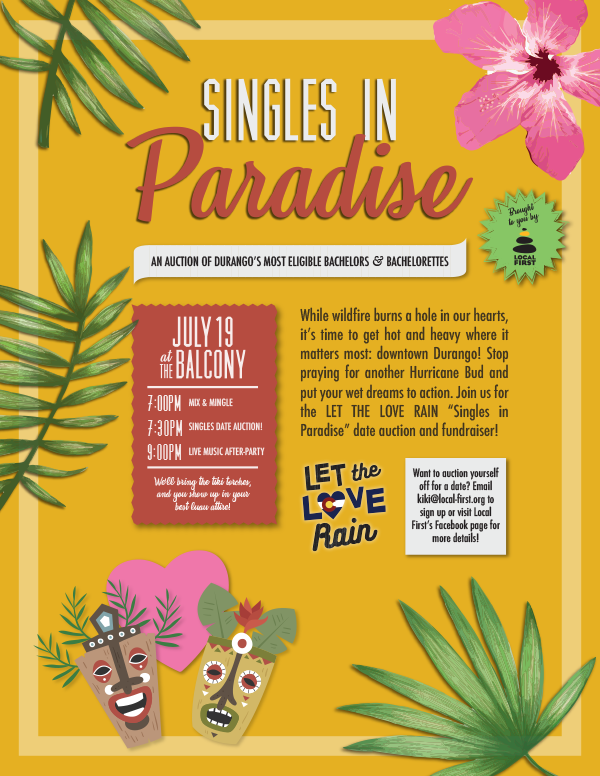 Show up to the Balcony Backstage 30 minutes before the event wearing your finest “Singles in Paradise” costume, or any costume for that matter. Monokinis and mustaches encouraged. Pantsuits and hoodies excluded. Buy a drink. Put out the vibe. Last-minute entries discouraged but welcome.